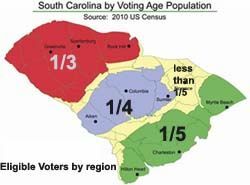 South Carolina exit polling numbers won't be released until the polls close. But everything else about them is being published, including that many voters decided whom to vote for in the last week and that the debates mattered, which bodes well for Newt Gingrich. Barack Obama is expected to make his victory speech any minute. Here's a place for your thoughts on it. Incredible. Barack Obama just wins the primary in South Carolina and less than an hour after the polls close, CNN switches to cover an endorsement of McCain and a speech by him. 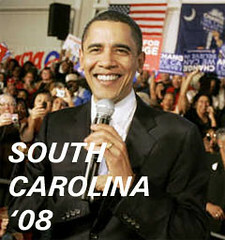 Is that a sign of the lack of importance the media gives to South Carolina? I may not be an Obama supporter, but this is insulting. Mike Huckabee gave a very gracious speech after the South Carolina Republican primary was called for John McCain. I've read a lot of comments wanting McCain to lose in S.C. because he'd be tougher for a Democrat to beat. I disagree. I don't think the S.C. results means McCain will win the Republican nomination. McCain will face a tough battle in Florida and tougher ones on Feb. 5. If Huckabee and Romney aren't considered serious contenders by then, it will be McCain and Giuliani. I think Republicans will choose Rudy. The last thing I want is for Giuliani to have a viable shot at the Presidency. He could be a far a more difficult ultimate opponent than McCain. My prediction: McCain's lead won't last. He's too old and the polar opposite of change that is so important to voters. The Tsunami states of Feb. 5 won't go for him. I'm hoping Huckabee and Romney do well in Florida and on Feb. 5. Anybody but Rudy.